You know John 3:16? Supposedly the first verse every Christian ought to know, and for good reason? Many people claim it’s overhyped, but I don’t think so. I think the gospel of John is filled with gems like these on Jesus. You know how some people summarise the gospels? Matthew – Jesus the King; Mark – Jesus the Servant; Luke – Jesus the Man; John – Jesus the God. Very sweeping, and any proper scholar of the Bible will probably scoff at that summary, but I think it apt enough for a one-line summary of the gospels. I’ve been doing re-Ver(sing) Verses for quite a while, and many of the verses I’ve picked were obviously verses that I’m more familiar with; but I’ve been avoiding John 3:16. It feels like I’ll not be able to do it justice, such a big, big verse it is. And yet when I reflect upon all my work here at RVV I wonder, which verse exactly have I done justice to? None, clearly, and I’m reminded that it’s okay not to do them justice. John 13:1 is a favourite verse of a friend, and let me just say right from the very start that I’m not going to do it justice – there’s so much in this verse that I’ll be overlooking in this very brief study. It was just before the Passover Festival. Jesus knew that the hour had come for him to leave this world and go to the Father – When was this exactly? We’re told clearly in the verse itself that it was just before the Passover feast. In the next verse, there’s a mention of the evening meal [John 13:2]. Is this evening meal the Passover feast itself? Most likely not, deducing from the events that happened during the meal. Instead, this was likely to have taken place 2 days before the feast, in line with the events of Matthew 26:1-13. This evening supper was likely to be in Simon the leper’s house. If not, it would be sometime between that supper and the Passover Feast. Hence, it would be within Holy week itself. Just days before the crucifixion. It’s like somebody on a death sentence knowing that it’s going to happen at the end of the week. The hour had come. Having loved his own who were in the world – Christ, in his 33 years of life on earth, was fully human – not 50% human, 50% god. Yet at the same time, he was fully God. His body was flesh and blood – he was human, just as we are humans today. We are the same human race. Species. Whatever you call it. And we belong to Christ. We are his own. He takes responsibility for us. He loves us. he loved them to the end – Dare I ask, when is the end? When is the end of love? 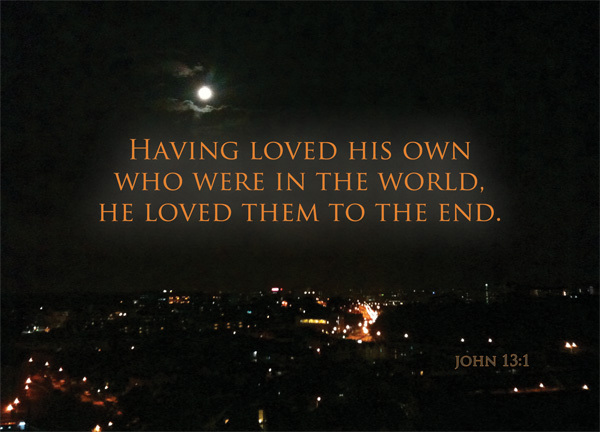 When is the end of Christ’s love for his own, who were in the world? This may seem obvious at first glance to anybody, but let’s think about this deeper. Two possibilities enter my mind – what about you? Let’s work this out bit by bit. The direct context of this verse, as stated in the verse itself, is just prior to the crucifixion. The hour had come. His life on this world was about to come to an end. That is the first likelihood – the end of his life on earth. The second would be the end of time itself. But when is the end of time? Is there even an end of time? We know that we have eternal life in the courts of God, and we will preside over the angels [1 Cor 6:3] with Christ at the right hand side of the Father. If there is eternity, when is the end of time? Is it the end of this world – i.e. destruction – perhaps, because if there is no more world, there won’t be anymore humans – his own whom require loving, and we would all be rejoicing together in the presence of the Lord. I’d like to argue that, when John wrote he loved them to the end, it wasn’t so much so to tell us that, he stopped loving us at the end; but more of a way to say – he never stopped loving us. Even in his final moments, he prayed for them – those who were unworthy, those who were sinners through and through; those who rejected him, abandoned him, mocked him. I like to use Stephen’s example as a more vivid description of this mentality – when Stephen the martyr was being attacked, or more precisely, stoned; he fell to his knees in prayer for God to forgive those who assaulted him. That was the priority – not running away (he probably couldn’t anyway), not struggling against his enemies, not cursing them with hatred. No, his love for his enemies came before his survival instinct. It’s that kind of love that we’re talking about in Christ, whom Stephen imitated right till the very end. Compare the words they uttered in their final breaths – Acts 7:60 [Article] and Luke 23:34. Immediately after John 13:1, the author recounted for his readers some of the instances of that love – Christ’s washing of his disciples’ feet, for one. In the same chapter, we find one of the greatest instructions on Christian love in John 13:34-35 – “A new command I give you: Love one another. As I have loved you, so you must love one another. By this all men will know that you are my disciples, if you love one another.” He repeats this subsequently in John 15:12 – My command is this: Love each other as I have loved you – and 15:17 – This is my command: Love each other. In his prayer just before he was arrested, Jesus prayed for his disciples – I will remain in the world no longer, but they are still in the world, and I am coming to you. Holy Father, protect them by the power of your name, the name you gave me, so that they may be one as we are one [John 17:11] – and for all believers – I in them and you in me—so that they may be brought to complete unity. Then the world will know that you sent me and have loved them even as you have loved me [John 17:23]. He prayed for their unity, in love. I’ll like to conclude with three takeaways from this verse. Firstly, let us be comforted and rejoice because Christ’s love for us is to the very end, and as I mentioned above, I see this not as he loves us till death, but that he never stops loving us. Secondly, let us return this unending love, and love him to the end as well. I don’t dare to say that we can love him for eternity – eternity is too large and long a scale of time that I cannot even begin to comprehend – but at least, for the subsequent years of life that I have on this earth, I can commit to love him to the very end. Thirdly, let us love each other with an unending love – not just our neighbours, but our enemies as well. It’s not hard to love God. It’s not even that hard to love God till the end. But to constantly love people, who are often unlovely (ourselves included) – let us cling on to the words of God and the commands of Christ – let us use the life of Christ as the very example that it is possible. We know love is sincere, love is kind. We know that God is love. We know all the qualities of love. But today, let’s just reflect on the timescale that the Christian love is supposed to run on – eternity.